NKOTB News: Update from the set of "Bunker Hill"
Here is an update from the set of "Bunker Hill" from the Boston Globe. It was barely 10 a.m., and Donnie Wahlberg was sitting at the bar drinking beer. The New Kid nuzzled a young redhead and then joined a few friends for a game of darts. 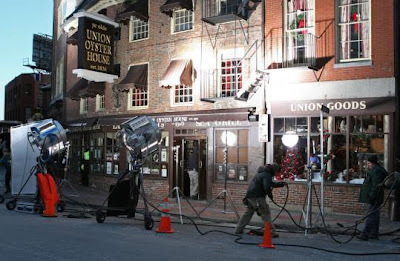 Welcome to "Bunker Hill," the TNT pilot that began filming yesterday inside the historic Union Oyster House. Owner Joe Milano said the cast and crew pulled up at his place at 5 a.m., and went right to work. "It's kind of like a carnival," whispered Milano, watching Wahlberg and Maria Thayer tape the bar scene. "Bunker Hill," which is being produced and directed by Jon Avnet, is about a Charlestown cop, played by Wahlberg, who returns to Boston to serve and protect his peeps. He costars with Brian Dennehy and actress Bridget Moynahan, better known as Tom Brady's girlfriend before Gisele Bundchen. (Bridget wasn't in the scenes shot yesterday.) In addition to the Oyster House, the pilot's being shot in Charlestown, Chelsea, and at the Tobin Bridge. Avnet, who worked with Wahlberg on "Righteous Kill" and "Boomtown," told us he isn't bothered at all by Boston's frigid weather. "These wimps from LA," the Brooklyn-bred director said, motioning to others in the room. "I like to watch them shrivel up in the cold." Also on set yesterday was Walon Green, the screenwriter whose credits include "Hill Street Blues," "Law & Order," and "NYPD Blue." I SURE WISH DONNIE WAS NUZZELING ME!! LOL! !